Woken up by those bloody noisy Germans again! Fairly relaxed start after yesterday even though the start was about 17km out of town, however the bike decided to put a stop to that and didn’t want to kick start this morning (remember it still had a flat battery from yesterday) but eventually we persuaded it into life. Having brimmed both fuel tanks, a full 18 litres at the fuel station last night, I was taking no chances of reaching CP1 and my Jerry can today. Especially as I had run out on the almost identical stage (but in reverse) on Monday. I had no dramas finding the start as I had ridden past the spot yesterday morning when charging up the battery, although I did miss the dirt track leading a few hundred metres to the start it'self. No problem as I just turned right at a convenient spot and rode "cross country" to the start line! I had arrived with plenty of time, so had a natter to a few other competitors, including the Coles, who were going great guns in their £800 Suzuki Jimny! Off the start (after kick starting the bike of course) and we were back on stony tracks, which did have the downside of plenty of dust, then into the “narrow valley” which was too narrow for the trucks. Not so much a valley as a narrow sandy track winding between stony, banks. In fact I discovered that in places, riding up over the banks was easier! This area was also well populated with photographers so I guessed they were expecting a bit of carnage! At the end of this section, the road book was a bit confusing and I suspected I should have turned left at a junction when I had actually gone straight on but soon realised I could just loop round the small hill to my left and re-join the route which was across a wide open area with plenty of choice. There were plenty of other riders going all over the place so I guess I wasn’t the only one. After this we were into wide open sandy and stony plains, so flat out was the order of the day, my trip meter was a bit out after my detour but thankfully we soon passed a turn by a fence (unusual that was clearly marked on the road book, so I was able to reset it to match the instructions. 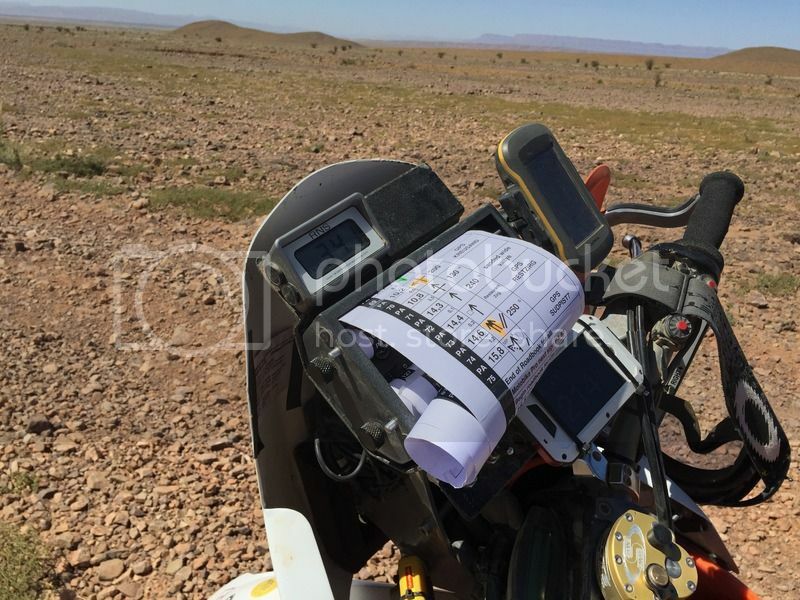 This continued for a long time and got a bit repetitive and almost lead to another navigation error, the instructions were “many pistes same direction” (well it actually said "manny pist" but that was one of the easier translation gaffes) across a huge dry lake bed for something like 15km. I was happily making progress now, pretty much alone except for the dust trail from another rider about a kilometre or so ahead of me. I glanced down at the GPS and noted that I was off to the left of the track, although I was on a clear piste with plenty of bike tyre tracks, there was a large isolated hill ahead and to my right. I guessed that the track should be going to the right of it, so angled off to the right and soon picked up another piste heading the way I wanted and I was soon back on the line of the GPS track. The rider ahead of me was still heading off to the left of the hill but I guessed we might meet up again around the other side. When I cleared the hill I glanced across and instead of seeing the other track coming back to join mine, I could see the other rider’s dust trail, now about 4 or 5 km away and heading well off track. I felt a bit sorry for him but that’s racing! I had been told that accurate navigation would always pay off and I was seeing that for myself. 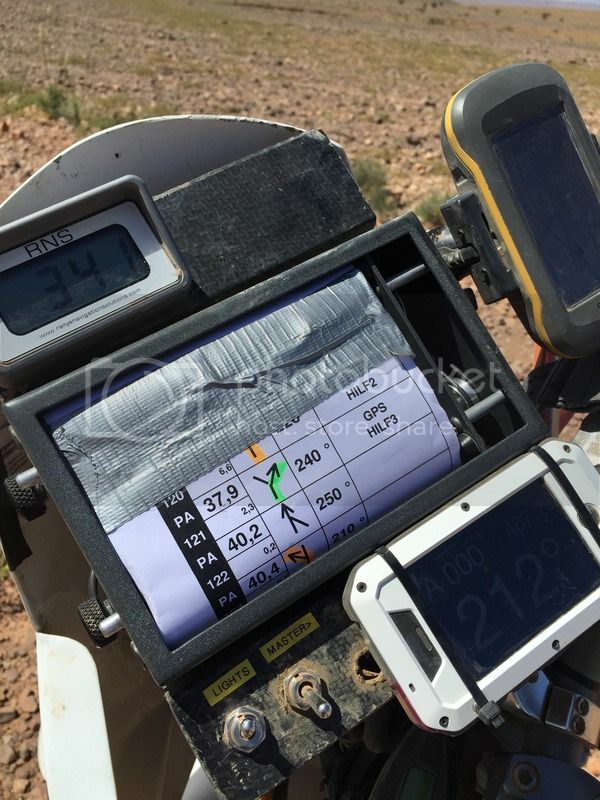 In fact my navigation throughout the rally was pretty spot on apart from a couple of minor errors when I missed turnings but knew almost immediately and back tracked to find them. One advantage of all this flat out running was I now had a fully charged battery, so no longer any starting issues! After a while we started to pass a series of isolated hotels (kasbahs) that were familiar from day two, when we had passed them in the opposite direction including one that was marked as "fuel available". It was the usual mud and straw construction of an outer wall around a courtyard favoured by most of the kasbahs (looking rather like a small fort) It was in a very remote spot with nothing even resembling a fuel pump, so I guessed it would be the petrol from a plastic bottle style of operation again, I didn't need fuel so carried on. I eventually reached an area of sandy hummocks, not really big enough to be called dunes with a multitude of tracks. This led to a slightly tricky drop off into a dry river bed, the road book being quite specific that you had to find the correct GPS point to avoid danger. I obviously did as I rode down a sandy slope into the river that cut through a bank about 2 metres high, that wouldn't be fun if you rode off it in the wrong place. We turned left into the river bed which was wide and very sandy making for quite hard riding for several hundred metres before turning right to exit.The exit was mush easier as there was no real bank on this side. The road book always referred to these dry river beds as Queds (pronounced "Kwed") which was another translation gaffe. It should be spelt Oued which in Moroccan (or more correctly Maghrebi) Arabic is pronounced "Wad" And is the origin of the term "Waddi" the term usually used for a dry desert river bed in English, although in fact Wad or Oued refers to any river valley dry or not. It's not easy being a Geographer in these circumstances! However as the organisers used the term "Qued" we, the competitors adopted it too! Another quirk of translation was in the vouchers we got for dinner, that were referred to as "bons". One evening, Rainer the organiser asked me if this was correct, or was "coupon" the better English term? He seemed quite upset when I when I explained it should be coupon or voucher as "bon" isn't an English term at all! Radu and Anny found this quite amusing as apparently "bon" is the correct word in Romanian! After leaving the Qued/Oued/Waddi we reached a Secret Check Point then entered an area of deep, soft, sandy tracks through an area of small dunes and camel grass that led towards the Qued Remlia, the scene of my little excursion into the mud on Monday. This time I passed one of the organisation’s huge MAN 8 wheel drive trucks stuck up to its axles only a few hundred metres from where I had got stuck, glad to see I wasn’t the only one! After crossing this Oued and the sharp turn where I had gone off course on Monday we entered a series of even more twisty, very soft sandy tracks. Here the technique was definitely to keep the speed up otherwise steering was near impossible. I found that getting into the wheel tracks of a car was also an advantage as your front wheel just follows it and they are reasonably straight. However the tracks left by bikes are formed by the back wheel that is fishtailing from side to side so are anything but straight! I was going well until the front wheel tucked under and I was over the bars…. This felt serious as I landed heavily on my side, knocking the wind out of me and causing such a sharp pain in my side I was convinced I had broken a rib or two. After getting myself back together (and clearing the sand out of everywhere), checking the bike, that was fine I was able to continue, despite being in some discomfort. More open piste soon followed and eventually I reached a point where the pro’s route headed off to the left, to climb “impressing sanded hills” as the road book put it and this had been highlighted at last night’s briefing. I missed the actual turning at a remote kasbah but no problem as I had to ride straight on anyway to climb over a low col. I did note I was now off the GPS route but as there was only one GPS track that day for all competitors, I assumed this was correct. And sure enough to my left was an impressive sandy cliff. As I climbed over the col I spotted the tell-tale flag of a secret check point (SCP) up on top of the cliff. This did put a bit of doubt in my mind but I guessed it was there to ensure the pro’s followed their route rather than the more direct amateur route I was on and which was very clear from my road book. As the track over the col opened up into a wide flat area, one of the Suzuki Jimnys in the Car Amateurs caught me but soon hard left and looped round to climb up to the top of the cliff. I could only think they too had seen the SCP and thought they had to visit it. I stuck to the road book and headed off across a huge open plain, the enormous wide open spaces were one of the things that really impressed me about Morocco especially compared to Britain’s crowded little islands. The wide open plain went on for some considerable time and I was maintaining a steady 110kph and as I approached the same band of trees where I had stopped on Monday to tighten my gear lever, I ran onto reserve. 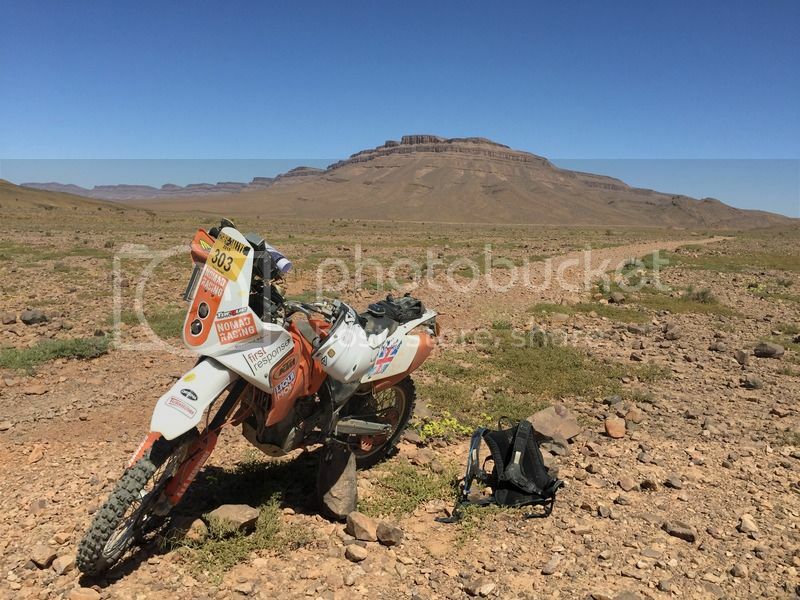 This was no problem as I had the rear tank still full and my Jerry can was at CP1 just over 30km away. However to use the auxiliary tank would mean stopping, getting my tools unpacked to find my side cutters, removing the side panel, cutting the cable tie keeping the petrol tap closed, turning it on, using another cable tie to keep the tap open and then putting it all back together again and packing away the tools. However I was really in the groove at this point so didn’t want to stop so carried to see just how far I would get on reserve. Bearing in mind I was riding at nearly my top speed I was very pleased to roll into CP1 without having to stop, 32km on reserve! Unlike Monday where we had used it in two separate sections, this time we rode the whole way on the piste. As a result a long boring ride ensued at a steady 75/80kph until we reached a SPC where we could re-join the original route, strange that this was still in the timed section, whereas it might have made sense to neutralise it instead, especially as the organisers could use the SCP to restart the timing? The route from here was over some very rocky tracks and the suspension certainly earned its keep despite the fact that my right hand fork now had very little oil left in it due to the leaking oil seal! At one point the road book suddenly tore, so I stopped to fix it. Unfortunately I went to put my stand down only to find it was no longer there! The pivot bolt that I had only replaced a week and half previously had snapped! Luckily I found a handy rock to park against and sort out the road book with some duct tape. The finish of the stage came after not too long but was in the middle of a wide open stony plain with nothing to park against. The checkpoint crew saw my dilemma and one of them ran over and held my bike up whilst I handed in my time card. 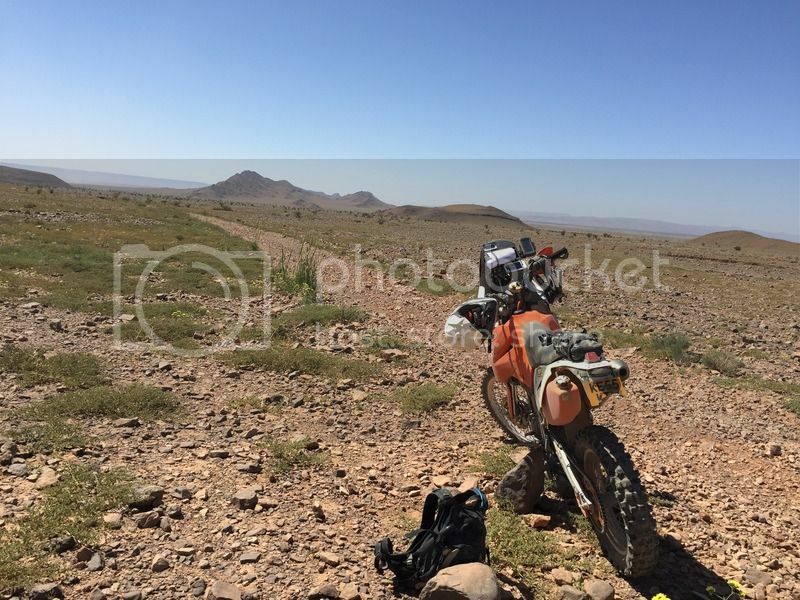 A short ride back to Zagora to the hotel, where I discovered John had not arrived as he was helping one of the German Service teams fix a puncture. With a strange sense of déjà vu I approached reception but this time they handed the room key over with no problem as they remembered me from Sunday night, we even had the same room! Again I had nothing to change into so did some maintenance on the bike until John arrived and I was able to have a long hot shower and get changed. As you can see, I needed that shower! 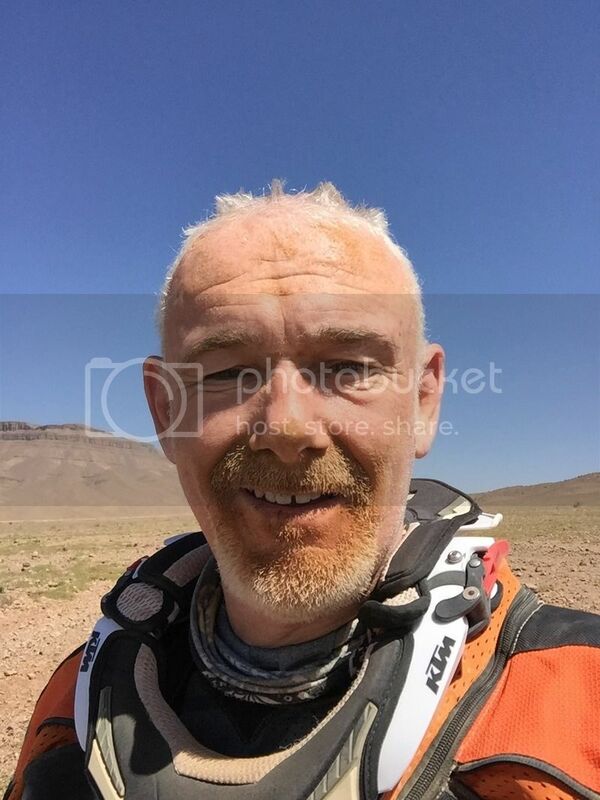 That night I had more good news, 21st in the combined amateur class on the stage and up to 3rd place overall in the moto amateur over 50s class…. Result!